Tokyo has one of the most extensive network systems in the world run by various different operators. If you have used other subway systems around the world before, you wouldn't find much of a difference using it. What you would notice, though, are the stations operated by different companies would seem to be like a station on its own. Also, should you find yourself at a station further than the fare you bought allows you to, you could simply pay for the fare difference instead of paying a penalty fee. Ticket machines accept denominations of 10, 50, 100, 500, and 1000 yen, and sometimes 2000, 5000 and 10000 yen too, and would even give out change for it. If you don't have enough coins to pay for the fare, but you have 5000 or 10000 yen notes, simply insert those notes. You will receive the change in notes and coins, in as few pieces as possible to make up the amount of change of course. Besides ones for the Shinkansen, credit cards are not accepted. The display language could be changed between Japanese and English. Example: Your fare is 220 yen. Apart from the 5 and 1 yen coins (which are not accepted by the machine) you have, you have inserted all the coins you have, but that amount add up to only 180 yen and the next highest denomination you have is a 10000 yen note. Just insert that into the machine and the machine would recognize that you have already inserted 10180 yen. You selected the 220 yen ticket, so the change would be 9960 yen in as few pieces as possible: one 5000 yen note, two 2000 yen notes, one 500 yen coin, four 100 yen coins, one 50 yen coin, and one 10 yen coin. Since the machine does not have 2000 yen notes (which itself is rare), the two 2000 yen notes are given as four 1000 yen notes instead. Confused? Don't worry about it. You just need to know that bills are given out as part of the change. If you can't read the Japanese characters of your destination on the system map, and the ticket machine doesn't give you the option to select the station in a language you understand, just pay the minimum fare and, at your destination station, pay for the fare difference to the staff at the manned gate or through a fare adjustment machine located just before the ticket gates. (I'm not sure what happens if you pay more than your destination fare.) If you try to do that without paying the difference, or head back to stations it's valid for, the ticket would come out at the insert slot and the barricade will close on you, so pay the fare difference at the fare adjustment machines or the manned gate. Do note that some fare gates are exclusively designed for stored-valued card users, as marked on the floor before it. Also, do note that stations operated by other companies are not listed on the fare map. If your can read the signs, but your destination is not listed on the map, head to the green counter (みどりの窓口; midori no madoguchi) and purchase a ticket there. To transfer to an another line that is operated by the same company, but requiring you to go through a ticket gate, please use the orange ticket gate or the fare adjustment machine when leaving the paid area. Pay attention to the signs as you might end up on the platform for the opposite direction (and possibly requiring you to leave the paid area to correct this), not realizing that there is a passage where you don't need to pass through the gates, or the orange ticket gate you may see while exiting is for an another line instead of the one you are transferring to. Do note that there might be a transfer rebate if transferring between Tokyo Metro and Toei lines. Check this guide if unsure. Note: You can use IC cards or a Passnet card (if bought within the past 10 years) to purchase a paper ticket. On machines that do not have a touch screen, the button to buy the ticket you need would appear only when you had already inserted the minimum amount of cash. Take note if that card you have is compatible with with the reader. A card you may have bought at other parts of Japan may not work. However, there may be agreements by the card companies to work on the system of an another. For example, ICOCA (Kansai area) and Passmo (Non-JR Tokyo trains) cards both work on the Suica system, and Suica cards can be used on the ICOCA system, but not Passmo. If unsure, check if the card could be read at the ticket machine. Example: you may see a PiTaPa (Non-JR Kansai trains) reader that says it would work with the ICOCA card, but that doesn't mean that a Suica card would work on it. 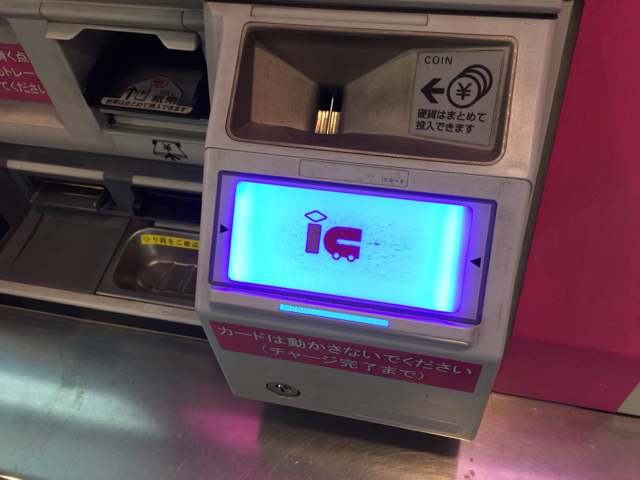 Assuming you have a valid Passmo or Suica compatible card, just scan the card over the reader and a blue light, along with a beep sound, should let you through. (If a red light appears instead, it indicates an error.) Simply tap the card again at the exit and the fare would be deducted from the card balance. Use the fare adjustment machine before the ticket gate, or the manned gate at the side, if the station is outside the area your card could be used at, or the card has insufficient balance. For the fare adjustment machine option, you can choose between recharging the card (minimum is 1000 yen), or pay the difference between the value on the card (rounded down to the nearest 10 yen) and the fare. If you are transferring to an another line operated by the same train operator, but requiring you to pass through the ticket gate to get to it, tap the card at the orange ticket gate of where you are transferring from, and tap in at where you are transferring to within 30 minutes. Do note that not all stations have it. You may see a number of ticket gates with IC being displayed. These are dedicated lanes to use your IC card with, but you can still use the other ticket gates with your IC card. Note1: You can purchase a paper ticket, or pay the fare difference, with an IC card. This can help you to zero-out the balance and pay the rest in cash. Note2: Due to the increase of consumption tax from 5% to 8%, fares have increased. However, if you were to pay with an IC card in the Greater Tokyo, the fares are slightly less than if you were to pay in cash. If you have an iPhone 7 or 7 Plus that was sold in Japan, or an iPhone 8 or 8 Plus or X for the rest of the world, and your device is linked to iCloud, you can get a virtural Suica card that would appear in the Wallet app like the other cards you use Apple Pay with. Note: Non-Japan iPhone 8/8+/X or newer users may need to change the region settings to Japan before the option to add a Suica card is avalable via the Wallet app. You can change it back later, and existing cards added to Apple Pay are retained throughout the process. First, scan the image of the rear of the card so that all corners are visible inside the frame. (You can't add different IC cards, including PASSMO, to do this at the time of writing.) Next, place the top half of your compatible iPhone on top of the card that you want to transfer from. Time it takes for this to happen can take a while, and the deposit of 500 yen would be refunded and added on top of the transfered balance. Once added, you can make it the default card for purchases. 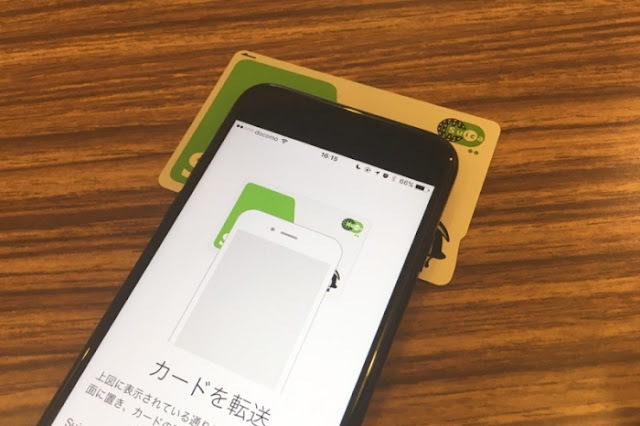 You can also enable a mode that would help staff access the card for issues you may have, or another where you could just tap the card without needing FaceID/TouchID verification each time each time you use a Suica-compatible reader. JR East has upgraded the ticket machines so you can check the details of your mobile Suica by placing it on top of a reader, and add new balance to it with cash. Other operators using non-Suica IC cards might not have this capability, which were designed to have the card to be physically inserted into the machine. Using this mobile Suica card outside the Kanto/Tohoku region may be possible as long as the regular Suica card is accepted as part of the interchangable IC network (typically other JR companies and major cities with subways), but their ticket machines may not have been upgraded to physically support your virtural card. The plus side of having this virtural card is that you can use your debit or credit card (including those of banks outside Japan) that's added to the same iPhone to charge your card, and you can enter any amount that you want to charge it with down to the last yen, as long as existing balance and amount you wish to add does not exceed 20,000 yen, which is the maximum Suica can hold. Handy if you don't want or can't use cash, or deal with that pesky non-zero last digit after you've used it in Greater Tokyo or on your purchase in stores. You can use the ticket machine to purchase the stored-valued card. A card costs 2000 yen: 500 yen deposit, and 1500 yen to use. The maximum that could be stored on the card, excluding deposit, is 20000 yen. All ticket machines in Tokyo will dispense a Passmo card, except JR stations, which dispenses the Suica card instead. Note: Administrative charge applies if you want to get back the balance on the card, and contains more than 210 yen. JR trains will always charge an extra fee for Express or faster trains. Private train operators might not charge this fee at all. Not as complicated to explain, partly because buses only play a secondary role when compared to trains. Buses usually have a machine that allows you to pay via the stored-value card mentioned in the trains section, and exchange 1000 yen note for coins. Buses have a display at the front that says the current/upcoming stops and/or, in the case of pay-as-you-alight, the fare you would pay for where you boarded is displayed too. In both cases, you would have to press the stop button (purple panel with a white button beneath it) before arriving at your stop, which a pre-recorded message usually announces the name of the stop. These buses are easily identifiable by the entrance (入口) being at the middle/back instead of the front, where the driver is, (unless there's only one door) which is where the exit (出口) is. When you board the bus, take the numbered ticket (整理券; seiri-ken) and keep it until you alight. Alternatively, tap your stored-value card on the reader. During your journey, the display at the front would be displayed and increases over distance. This displays the fare for the bus fare for a group arranged according to how early in the bus journey you have boarded. The number printed on your ticket is the group on the fare display you are in. At your stop, head to the front and drop your ticket, along with the fare, into the slot. If you used a stored-valued card at boarding, tap the card on the reader, mounted on top of the cash payment machine, while alighting. The order is the reverse of the above (and is certainly more familiar to visitors from abroad) where you would pay for the fare on boarding. Payment method is the same as when alighting as mentioned the previous section, with the difference being not needing to take a numbered ticket, or using the stored-valued card only once.